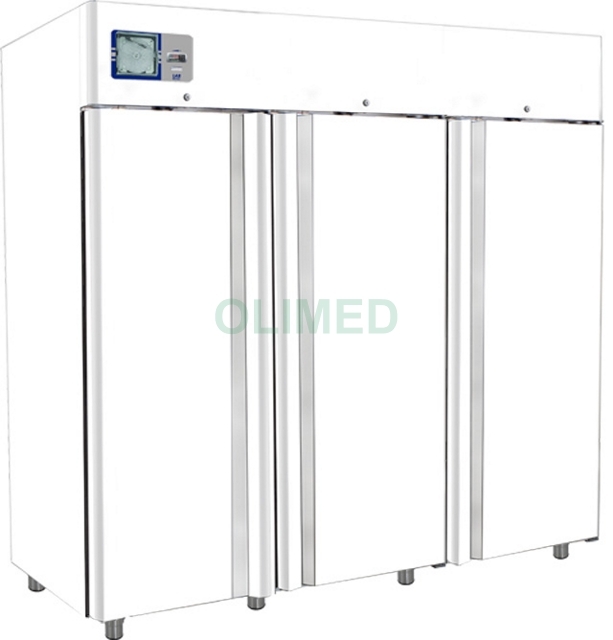 Refrigerator - Capacity 2100 LT - Temperature: Fridge +2 ° to +8 ° C - Electronic control - H.A.C.C.P. as standard - Compact refrigeration system - Auto defrost - Auto evaporation - Gas: R404a - Polyurethane insulation 60 mm - CFC/HCFC free - 20% saving on energy consumption - 304 Grade Stainless Steel Interior, white plastificated steel Esterior - Interior rounded corner - Door lock as standard - Interior Light as standard - Adjustable Inox feet - Reversible & Self closing doors - Plastic-coated shelfs - dim. 530x650 mm - Stainless Steel shelfs - dim. 530x650 mm and Chart recorder available on request. External Dimensions WxDxH (mm) 2160x800x2120 - Internal Dimensions WxDxH (mm) 2040x665x1520 - Ambient temperature (˚ C) +43 ° C - shelves (n) 3 for each door.